From 19 to 24 May, the exhibition ‘Made in Europe’ will be set up in the heart of each district of Barcelona. The exhibition looks back at the construction of Europe in the last 30 years by means of the most important architecture highlighted by the Fundació Mies van der Rohe through its awards. In order to expose the neighbourhoods to architecture, ‘Made in Europe’ will be located in 11 containers distributed in the districts of the city of Barcelona and in two extra venues. Inside each container you will find architectural models related to a specific theme: administrative, cultural, sports, entertainment, office buildings and more. The containers will also include maps so you can discover the most influential architecture in your neighbourhood. This container will hold models of European institutional and administrative buildings (city halls, courthouses, embassies, police stations, prisons, fire stations and more). Here you will find models of some of the most representative works of European architecture related to buildings with more than one use: schools, libraries, cultural centres, sports centres, hotels, offices, shopping centres and more. 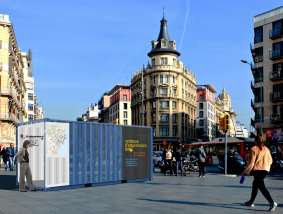 The Sants-Montjuïc container will have models of cultural buildings, from museums, theatres and concert halls to cultural centres and art galleries. This group of European projects is complemented by the Horta-Guinardó container. This container will focus on European sports and leisure buildings, from works on a small scale to large sports stadiums. Due to the size and requirements of some of the works, the architectural solutions are often linked to technological innovation. Here you will find models of European education buildings, such as kindergartens, schools, vocational centres, universities, research centres, archives and libraries. The Gràcia container will hold models related to production and consumption (hotels, restaurants and shopping areas, but also groups of offices and facilities) built in Europe between the 1980s and today. This container will focus on models of cultural buildings, from museums, theatres and concert halls to cultural centres and art galleries. This group of European projects is complemented by the Sants-Montjuïc container. This container will feature models of both collective and single-family housing buildings built in Europe between the 1980s and today. This group of European projects is complemented by the Sant Martí container. The container in this district will hold models of European landscape projects built between the 1980s and today. Here you will find representations of parks and gardens in urban areas and works that have regained and regenerated natural areas like quarries. This container will feature models of both collective and single-family housing buildings built in Europe between the 1980s and today. This group of European projects is complemented by the Nou Barris container. Here you will find models of shopping centres and office buildings that house both small companies and large multinational firms, workspaces and corporate spaces that seek to convey their business philosophy by establishing symbols of power. At the entrance of PALAU DE LA VIRREINA you will find 5 maquetes and imatges from nominated works to several editions of the EU Mies Award by RCR studio. HOTEL ALMA hall will feature models of landscape works nominated at the European Union Prize of Contemporary Architecture – Mies van der Rohe Award.